钱晓华, 杨平, 周学军, 胡荣根, 孙海龙, 张兆坤, 孙旭进. 安徽省土壤有效硫现状及时空分布[J]. 植物营养与肥料学报, 2018, 24(5): 1357-1364. QIAN Xiao-hua, YANG Ping, ZHOU Xue-jun, HU Rong-gen, SUN Hai-long, ZHANG Zhao-kun, SUN Xu-jin. 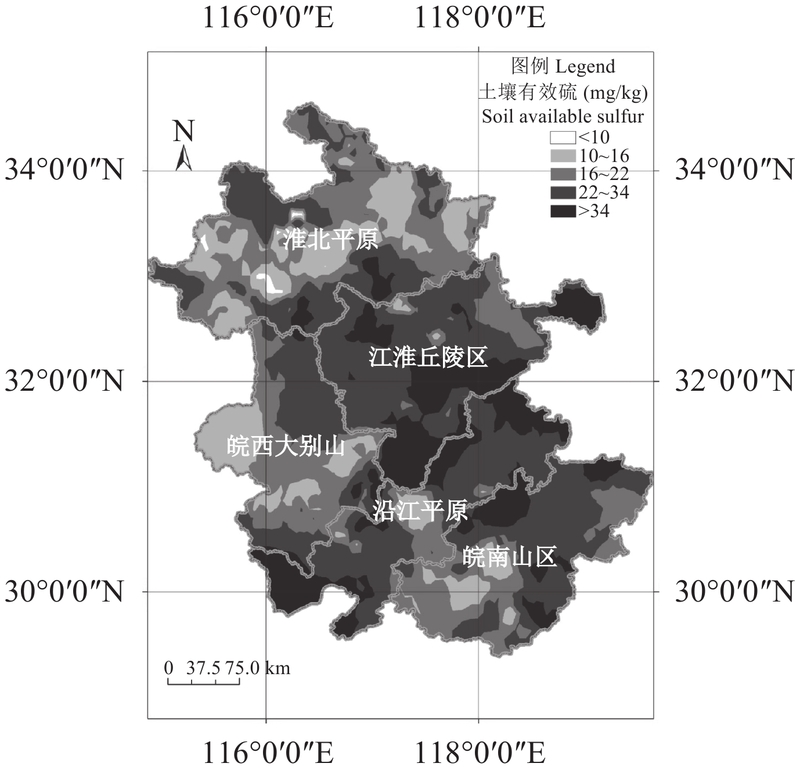 Current situation and spatial-temporal distribution of soil available sulfur in Anhui Province[J]. Journal of Plant Nutrition and Fertilizers, 2018, 24(5): 1357-1364. Abstract: 【Objectives】 Soil available sulfur (S) is the main source for plant S nutrition. The regional soil sulfur efficiency of the arable land in Anhui Province was systematically studied so as to provide reference for scientific application of S fertilizers and the balanced fertilization. 【Methods】 345 thousands of soil samples were collected from 0–20 cm soil layers around Anhui Province. The covered soil types included fluvo-aquic soils, lime concretion black soils, yellow-cinnamon soils and paddy soils etc. 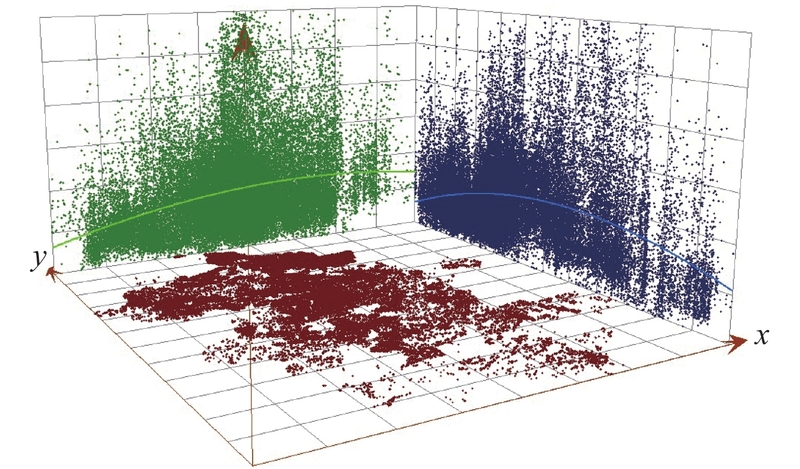 The spatial-temporal distribution of soil available S content was analyzed using large sample data and Kriging interpolation on ArcGIS platform. 【Results】 1) Soil available S was in the range of 0.10–101.90 mg/kg with a mean of 24.99 mg/kg and a median of 21.00 mg/kg. 2) Soil available S was generally insufficient, 53.1% of the total samples were deficient in soil available S (< 22 mg/kg). 3) The situation of soil available S deficiency increased from east to west and from middle to south and north. 4) The soil available S deficiency became worse in brown soils, yellow fluvo-aquic soils, skeleton soils, red soils, yellow soils, purple soils and lime concretion black soils. Compared with 20 years ago, soil available S deficiency was alleviated along the Changjiang River Plain, Jianghuai Hill and West Anhui, but became more serious in south Anhui. At present, the frequency and risk of soil available S deficiency increased in brown soils, lime concretion black soils and yellow-brown soils, but decreased in yellow fluvo-aquic soils, yellow-cinnamon soils and grey fluvo-aquic soils. 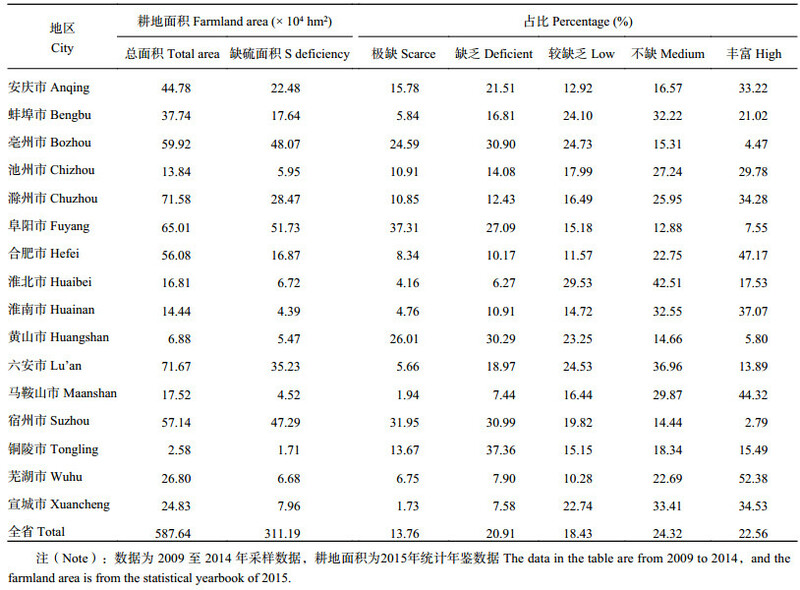 【Conclusions】 The arable land area with soil available S deficiency (< 16 mg/kg) and relatively deficiency (16–22 mg/kg) was about 311.19 × 104 hm2, accounting for 53.1% of the total cultivated land in Anhui Province. Considering the high ratio (39.67%–56.89%) of soil available S deficiency (< 16 mg/kg) in the 9 soil types including brown soils, lime concretion black soils, yellow fluvo-aquic soils and red soils etc., S fertilizers should be applied to decrease the risk of crop S deficiency. 注（Note）：* 2005—2014 年全省采集全部样品的数据汇总统计 Statistics of all the samples from 2005 to 2014. 注（Note）：*国家标准为全国第二次土壤普查有效硫分级The national grade is the “Classification of soil available sulfur in 2nd National Soil Survey”. 注（Note）：数据为 2009 至 2014 年采样数据，耕地面积为2015年统计年鉴数据 The data in the table are from 2009 to 2014，and the farmland area is from the statistical yearbook of 2015. 注（Note）：数据为2009至2014年采样数据 The data in the table are from 2009 to 2014. 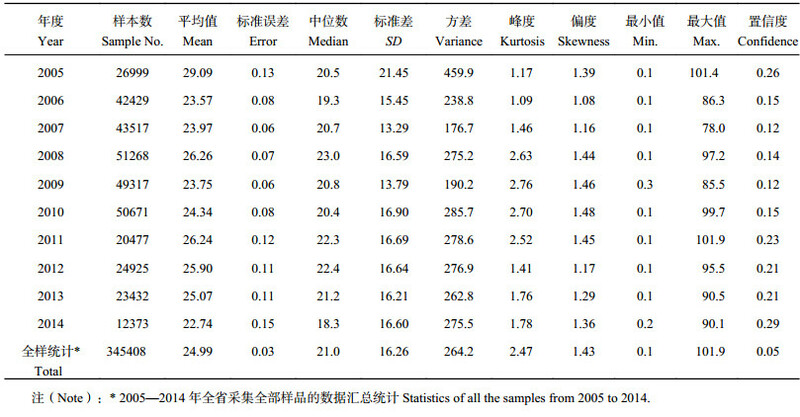 注（Note）：数据为2009至2014年采样平均值 The data in the table are the sampling average from 2009 to 2014. 注（Note）：YFA—Yellow fluvo-aquic soil; GFA—Grey fluvo-aquic soil; LCB—Lime concretion black soils; YC—Yellow-cinnamon soils; YB—Yellow brown soil. 刘崇群. 中国南方土壤硫的状况和对硫肥的需求[J]. 磷肥与复肥, 1995, 10(3): 14–18. Liu C Q. Status of soil sulphur in south China and demand for sulphur[J]. Phosphate & Compound Fertilizer, 1995, 10(3): 14–18. 杨力, 刘光栋, 宋国菡, 等. 山东省土壤有效硫含量及分布[J]. 山东农业科学, 1998, (2): 3–6. Yang L, Liu G D, Song G H, et al. Available sulphur content in soil and distribution in Shandong Province[J]. Journal of Shandong Agricultural Science, 1998, (2): 3–6. 胡正义, 徐成凯. 土壤中的硫与环境质量[A]. 陈怀满. 土壤中化学物质的行为与环境质量[M]. 北京: 科学出版社, 2002. 283–307. Hu Z Y, Xu C K. Soil sulphur and environment quality[A]. Chen H M. Behavior of chemical matter in soil and environment quality[M]. Beijing: Science Press, 2002. 283–307. Ceccotti S P, Messick D L. The growing need for sulphur fertilizers in Asia[A]. The Sulphur Institute (TSI), Chinese Sulphur Acid Industry Association (CSAIA) and Chinese Soil and Fertilizer Institute (CSFI). Present and future raw materials and fertilizer sulphur requirements for China[C]. Beijing: TSI, CSAIA and CSFI, 1993. 25–44. 高义民, 同延安, 胡正义, 等. 陕西省农田土壤硫含量空间变异特征及亏缺评价[J]. 土壤学报, 2004, 41(6): 938–944. 刘祟群, 曹淑卿, 陈国安, 等. 中国南方农业中的硫[J]. 土壤学报, 1990, 27(4): 398–403. Liu C Q, Cao S Q, Chen G A, et al. Sulphur in the agriculture of southern China[J]. Acta Pedologica Sinica, 1990, 27(4): 398–403. 张继榛, 竺伟民, 章力干, 等. 安徽省土壤有效硫现状研究[J]. 土壤通报, 1996, 27(5): 222–225. Zhang J Z, Zhu W M, Zhang L G, et al. 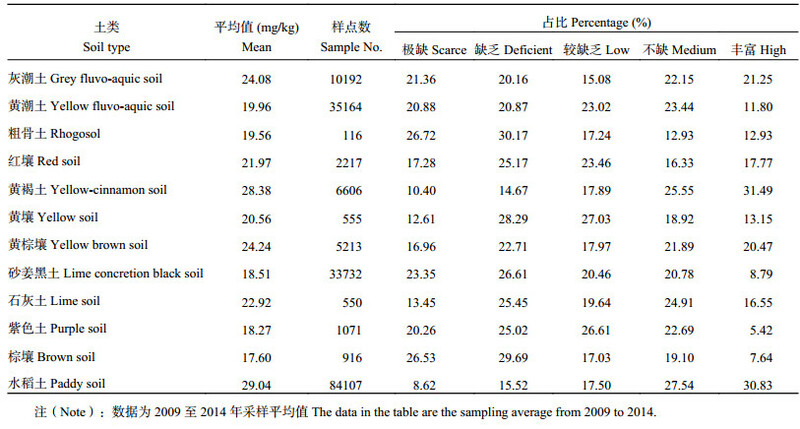 Study on soil available sulfur actuality of Anhui Province[J]. Chinese Journal of Soil Science, 1996, 27(5): 222–225. 章力干, 张继榛, 竺伟民, 葛承文. 淮北土壤有效硫状况及其影响因素[J]. 安徽农学通报, 1999, 5(3): 16–18. Zhang L G, Zhang J Z, Zhu W M, Ge C W. Available sulfur distribution and its affecting factors in soil of Huaibei Area of Anhui Province[J]. Anhui Agricultural Science Bulletin, 1999, 5(3): 16–18. 胡正义, 张继榛, 竺伟民. 安徽省主要农用土壤中硫形态组份的初步研究[J]. 土壤, 1996, 28(3): 119–122. Anderson G C, Lefroy R, et al. The development of a soil test for sulphur[J]. Norwegian Journal of Agriculture Sciences, 1994, 15(Suppl. ): 83–95. 林葆, 李书田, 周卫. 土壤有效硫评价方法和临界指标的研究[J]. 植物营养与肥料学报, 2000, 6(4): 436–445. DB34/T2846- 2017. 硫肥合理施用技术规程[S]. DB34/T2846-2017. Technical regulations for the rational application of sulfur fertilizers[S]. 李中元, 何腾兵, 赵泽英, 彭志良. 土壤养分数据几种特异值处理方法的比较[J]. 贵州农业科学, 2008, 36(2): 93–96. 汤国安, 杨昕. ArcGIS地理信息系统空间分析实验教程[M]. 北京: 科学出版社, 2006. Tang G A, Yang X. Geographic information system spatial analysis experiment tutorial[M]. Beijing: Science Press, 2006. 王晓玉. 黄山市土壤主要养分空间变异特征及其影响因素研究[D]. 合肥: 安徽农业大学硕士学位论文, 2015. Wang X Y. Spatial variation of soil nutrients and its influential factors in Huangshan City[D]. Hefei: MS Thesis of Anhui Agricultural University, 2015. 宋伟汉, 周学军. 太湖县耕地土壤有效硫含量及硫肥效应研究[J]. 安徽农学通报, 2010, 16(10): 59–60.